Mosaic color can be changed by a selected scale. Scales are Major Scale, Natural Minor Scale, Melodic Minor Scale, Harmonic Minor Scale and Gypsy Scale. You can select from "Change Mosaic" menu them. There are two kinds of selections. "Adjust Half Step" is not applicable RGB values are adjusted a half step up or down, it depends on the note. "Replace to No Sounds" is not applicable RGB values are replaced to no sounds that is RGB value 0. They will be same as rests in the music. Mosaic color will be closer to a primary color or black. Please listen the sample music "Gypsy Smile". I was teaching English Literature when I first came to Thailand and used a fairly up to date book called Metroland, which was later made into a mediocre movie with some lovely shots -- for a better visual and historic idea of the time and the area, John Betjeman's own, Metroland -- a documentary -- is closer. One passage in the book has the two teenage characters experiencing music and coming up with comments based on what they feel: of Bruckner, one of them linked the idea of "Jackboots", which in 50s Britain, a short time after World War 2, was still an emotive term. As a way to get into the feel of the book I was trying to teach, I used this idea and played some tapes that I had with me (including some Bruckner) and asked the students to listen and write down what they felt. For some Thai students, used to True/False or checking boxes even in classroom exercises, the idea of such academic freedom is anathema: a dangerous chasm. Reluctant to produce an answer when there was neither right nor wrong, some wrote nothing. Others, however, did respond and it was encouraging to hear comments like "storm" and "spring" when they heard Beethoven's Pastoral Symphony (Number 6). This is a form of synaesthesia: "the production of a sense impression relating to one sense or part of the body by stimulation of another sense or part of the body" (Dictionary application, OS X). I came across this word earlier when looking at comments for a utility called RGB Music Lab -12. It was the comment, more than the utility (initially) that encouraged me to make the download from VersionTracker. iTunes has the reverse of this with its Visualiser controls producing floating images from the music input, perhaps best viewed late at night with a suitable drink (orother stimulant) by your side; but RGB editor takes the opposite approach: the input is visual, the output aural: turning the spacial into temporal. The download was rapid enough and the zip file opened into a folder with the application, that looked like a copy of the Mona Lisa, and some other files. As these seemed to be necessary components (data folder containing "Enhanced QT.bundle) I decided not to separate them and put the whole folder into the Applications>Utilities folder. Double-clicking on the icon brings up the Leopard warning that this was downloaded from the Internet (some people think this is overkill, but with the news of a probable Trojan affecting DNS redirects, a lot of users may benefit from such reminders). Before opening fully there is a welcoming screen with some information about the operations and a couple of icons for PayPal and Kagi: Kenji Kojima is an unsupported developer. The default image is Mona Lisa, or rather a section of Da Vinci's famous painting and it is loaded into a right hand panel. The left panel contains a mosaic of the same image -- a low resolution produces considerably greater blockiness. This resolution may be changed from a low of 3 up to 100 (I presume %), with the higher figure giving the best resolution and also the longest music. The mosaic formation may also be changed using a button above the left panel. 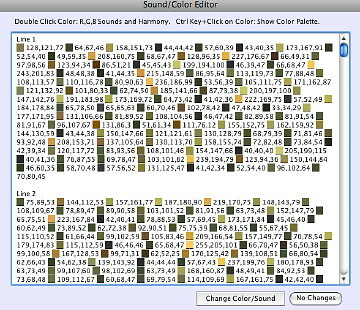 There are fourteen ways in which to change the mosaic creation, first with a sound editor and then a range editor. In the former, a table with colours and values is displayed. Clicking on the colour produces a sound, depending on other settings (below). The values may be changed here. 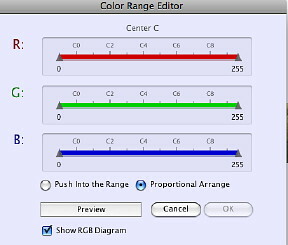 In the range editor, similarly the RGB (red, green, blue) values may be adjusted using sliders. Revert undoes any changes that are made, while Random Mosaic creates exactly that: an uncontrolled image using the basic colours of the original image (Mona Lisa is mainly greens and browns). There are also two Flip commands: horizontal and vertical. As the images are reversed the notes of any music produced will also then be in a changed order. Likewise with Rotate (90 degrees clockwise or counterclockwise): a different rendition of a colour scheme will produce another output. In that left hand panel a click will select RGB Harmony or the default Separated RGB parts. With the former, one button is available from which to select from a wide range of instruments, from Acoustic Grand Piano (default) to Car Engine, with a range of the sublime and gorgeously ridiculous between. The Separated RGB allows an instrument for each colour with (again) Acoustic Grand Piano as default. A checkbox with the two above is marked "Use Panpot" -- a term I am not familiar with. When this is checked the position of the instrument from left to centre to right, with some fine-tuning in between could be selected; this suggested to me how much care has gone into the creation of this software. The right panel is where the action starts and ends. While Mona Lisa is default, as mentioned, a function of the panel is to allow users to drag their own images there. A Bangkok street scene is discordant enough in its own right, so it seemed the perfect image to start with (although I did export it from iPhoto as a medium size JPG image first, just in case). It was imported into the right panel with no delay and a mosaic was created in (what?) half a second. At the bottom of this panel are the controls for the actual creation process, with the main one marked, "Create RGB Music." When pressed, there is a delay (depending on the resolution of the image among other settings) and a control bar appears: click and the music plays. With RGB of Electric Grand Piano, Pan Flute and Sitar, and a 25% mosaic, and with the Tempo (right panel) up to a figure of 265, my Bangkok image produced something not unlike what traffic feels like here with its discordant nature, yet an overall flow mechanism. Adjacent to the "Create" button is one marked "Save Music" which creates a MIDI file in a location selected by the use. 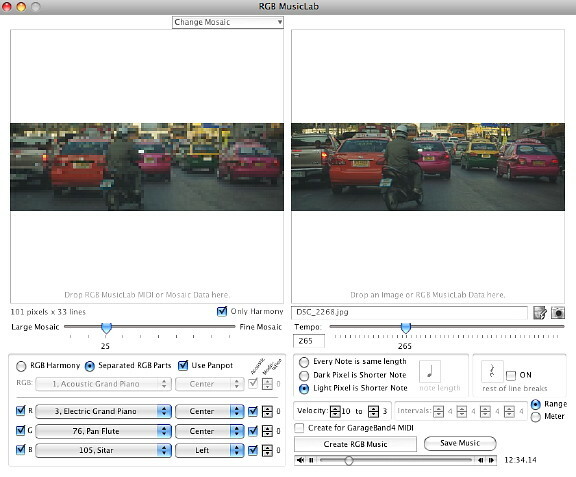 I noticed in the Information for the file I made from the Bangkok image that the copyright of the file was shown as belonging to "RGB MusicLab by Kenji Kojima" but I am unsure if that refers to the file itself as the image was mine, although the unregistered software was his. I am not suggesting anyone is going to be another Stockhausen, but copyright may restrict the use of such files on web pages or in movie files (e.g. YouTube). I did send email to query this. [modified] Kenji Kojima confirms that we can use the music for anything we like, such as blogs or anything else we want, including commercial performance. In the right side panel, as well as create and save music buttons, there is an option to create for GarageBand, where it is possible for a user to enhance the music to a considerable degree, with the loops and other effects that may be added. 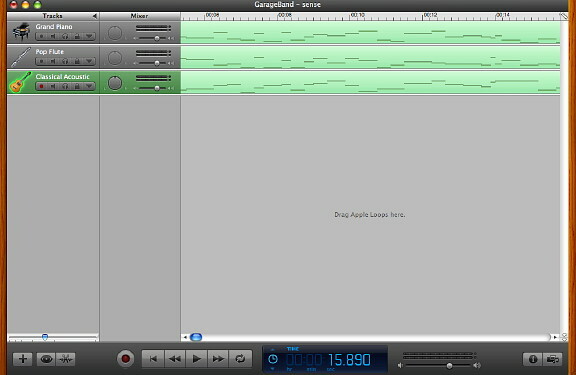 I did this to use Garageband to cut the file to 1 minute from its original 12 minutes. The file was imported and broken into its three constituents (although 5 tracks were originally available: I deleted the two redundant ones, cut the time then sent it to iTunes (although I could have as easily made a ring-tone. The beauty of such software is in its imperfections and the way that a user is free to experiment and come up with an infinite number of variations to the music. There is of course an entertainment value here as well as the idea of artistic creation; but there may be other values to this as well. A colleague who works as a bio-medical engineer wondered if such software might be useful for blind persons as a way to translate an image into the aural thus giving such a person additional input. This would, of course, mean a considerable amount of work and development, but it is a field in which there is still a long way to go. On the web pages that Kenji Kojima has created to go with the application, there are clear instructions on how to use the software and he mentions its compatibility with OS X Leopard. He also outlines a problem with the Save dialog layout which may be broken and suggests using Save As instead should this occur. In addition he provides a good collection of examples both of the Art that was used (where copyright permits) some examples of creations and the ways in which the music could be used.